Note: We recomend that you use transmission mount 355-3-1108G (or equivalent). JEGS solid front engine mounts provide a firm foundation for racing or the serious street enthusiasts. They keep the engine in its place, eliminating the movement caused by stock flexible rubber mounts. When limiting engine movement, linkages operate smoother. 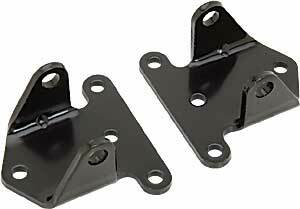 (Transmission manufacturers recommend using urethane transmission mounts when using solid engine mounts.) . Does JEGS 50510 fit your vehicle? 50510 is rated 5.0 out of 5 by 2. Rated 5 out of 5 by Ta2019p from Heavy duty..well made Seem to be good quality. Haven't installed them yet.